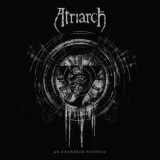 Hailing from Portland, Oregon, Atriarch are a very difficult band to sum up. Taking equal parts from gothic rock and doom metal, with a fair slice of blackened influence, this is gloomy music first and foremost, driven by plaintive vocals from Lenny Smith and slow, ponderous riffing from Brooks Blackhawk. Listening to it is immersing yourself in misery, which has made writing about it difficult – although I'm not on record as being the happiest of campers in the past, nowadays my depression has receded enough to make it only notable on some dark days. I know misery when I hear it, though, and An Unending Pathway is plainly a miserable album, and not at all an easy listen. What makes it more than attractive to doombahs is the sheer variety, and skill in tying these various strains of misery together. The out and out funeral doom of Revenant, for example, is followed well by the intense blasting of the black metal-touched Bereavement, the latter's shift into doom tying the two tracks together well. And the quieter, more contemplative moments, such as the sinister opening to Rot, have a powerful atmospheric punch that stays with you longer than the 'heavier', more sonically busy moments. But this album isn't about the moments (as good as some of the moments are, such as Veil's descent into almost ritualistic madness with throat-singing) but about the overwhelming, all-pervading sense of unhappiness that hangs over it like a foul stench, and atmospherically this is one of the better albums I've heard this year. Doom fans should be all over this, if they aren't already.